Nunavut is the most recent of all Canadian provinces. Being hived out of the Northwest Territories back in 1999. Nunavut has supported an indigenous population for at least 4000 years. However, it was Martin Frobisher from England who started the first written records of Nunavut. Nunavut was not home to any important minerals, though many thought they had found gold. However, many explorers continued to explore the territory in search of the elusive "North west passage." This passage would allow far shorter trips from Europe to Asia. This was of course, in the time before the Suez and Panama canals. To travel to Asia, sailors faced long trips round the south of Africa, or round the treacherous seas round southern America. 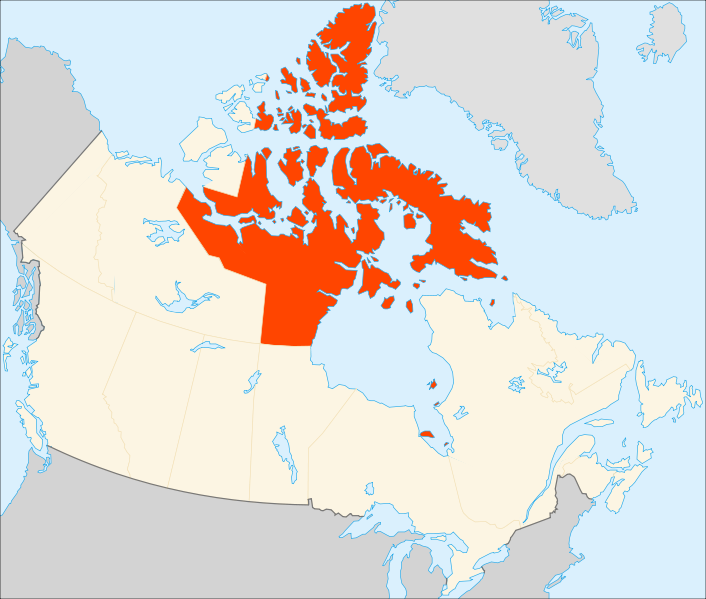 In 1982, the Inuit where granted a plebiscite on division in order to settle long standing claims from the Inuit. The vote, not surprisingly, went in favour. And discussions began on separating Nunavut from the Northwest Territories. This process took a long time, with the first agreement agreed in 1992, and ratified in 1993. Following various Acts being passed by Parliament, separation finally occurred in 1999. For Nunavut, they had to bring in new icons for the territory. This meant a new coat of arms, and a new flag. The coat of arms was granted on March 31, 1999. Just 1 day before Nunavut formally came into being. The same day as the flag. 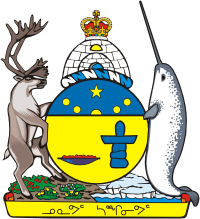 The coat of arms was designed with a great deal of discussion with elders from the Inuit in order to get this right. The shield itself is a roundel, rather than an escutcheon shape which is much more common in European heraldry. The shield is divided into blue and gold,representing the sky, and the riches of the land. In the sky is a representation of the midnight sun, with several roundels tracing a path through the sky. Also featured is a representation of the North Star. On the gold is a qulliq, which is a stone lamp. This represents the warmth of the community. Also, there is an inukshuk. This serves as a guidepost, and as a symbol of a tribes territory. The crest is an igloo. This represents traditional life, survival, and the government of Nunavut. It is topped with a crown, this represents Royal sovereignty. The supporters are a narwal, and caribou. These represent sustenance, and the natural resources of the land and the sea. They stand on a compartment made of Arctic poppies, dwarf fireweed, Arctic heather, next to an iceberg at sea. 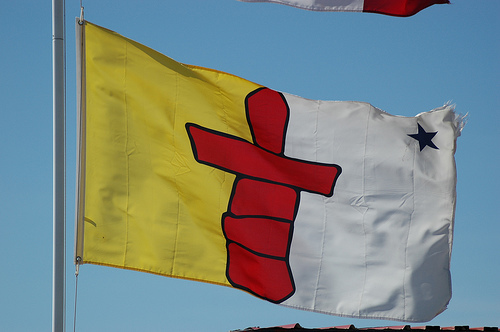 Following a great deal of input from local communities, and tribal elders, the flag took elements again, that are important to the Inuit. After a great deal of consultation, and competition, the final design came out in time for the official birth of the new territory. The new flag also features an inukshuk. This is placed in the centre of the flag, stretching from top to bottom. This is different to the crest, in that it is red. And edged in black. The flag itself is divided by the inukshuk. Gold on the hoist side, and white on the fly. In the upper right is a blue star. The gold and blue represent the land, sea, and sky, whilst the red of the inukshuk represents Canada. The star represents the North Star, or "Niqirtsituk." An important navigational marker used by the Inuit for thousands of years. also it is there to represent the wisdom and leadership of community elders. Is this the official flag of baffin island?